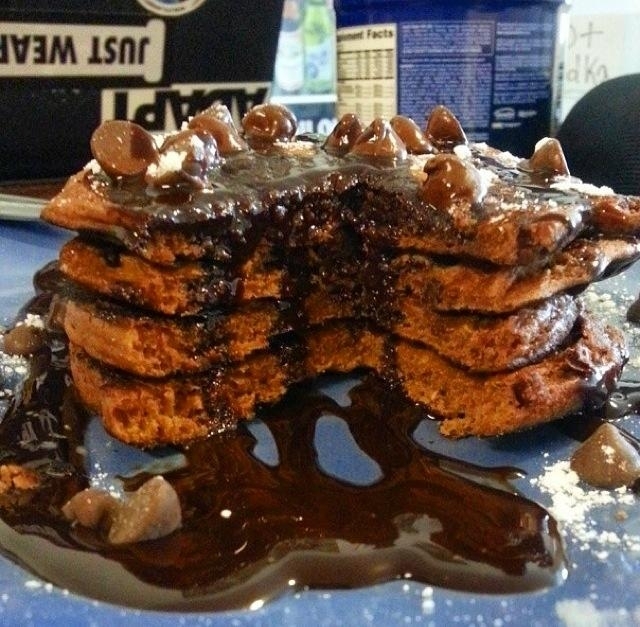 Easy chocolate caramel protein pancakes. Interchange all purpose flour with your preference, for example coconut flour or maybe oat flour. 1.Create your batter by mixing one serving of flour, one scoop of chocolate whey, 2 tbsp of unsweetened cocoa powder, 1 tbsp of baking powder, and the 6 tbsp of eggwhites. 2. Pour the batter into a hot pan or griddle. Cook each side for 45 seconds to a minute. 3. Once done set the pancakes aside and place your chocolate chips as desired and pour your syrups over the top. 4. Dust the pancakes with confectioners sugar if you'd like.